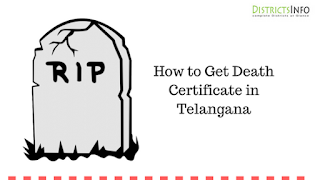 How to Get Death Certificate in Telangana, GHMC Death Certificate, Register for Death Certificate in Telangana, Apply for Death Certificate in Telangana: A death certificate is a document issued by the government of India stating the cause of death and the time period he/she lived. Now it is becoming one of the most important certificates or documents in India. As if you don't have death certificate then you can face some problems. Like there are many peoples who get some benefit from the Indian government in terms of pension, loan, food, etc. So after their death, you must show their death certificate to the government so that they can hold these benefits or act accordingly. In India, you must register the death of your family members or any person you want to within 21 days from death. 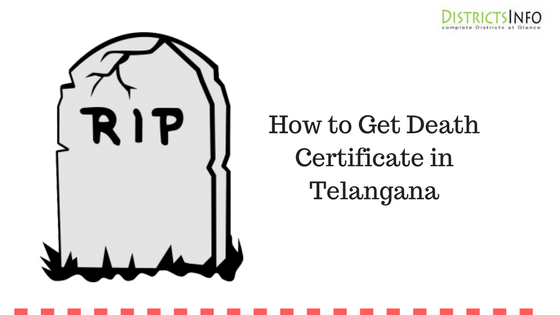 So here in our article, How to Get Death Certificate in Telangana we will tell you all about the procedure to get a death certificate in Telangana. Also, you can check How to Apply for Voter ID card in Telangana. So in India death can be reported by family members if it occurs in the family, by jailor if it occurs in jail, by a medical in-charge if it occurs in a hospital, etc. But you just register it before 21 days with some proof of death. Like a paper from medical in-charge, proof from the burial ground, etc. With this, you must have some other documents and go to the official who takes care of these things. In our article, How to Get Death Certificate in Telangana we will tell you every information related to the death certificate in Telangana. Any citizen who is living here can go for death certificates of the family members. * Birth Proof of the dead person. * A proof containing death and time of death. * Required fee in form of stamps. * Ration card if possible or any other document. * Person who is applying for death certificates must prove themselves as a family member. * First of all you must register the death to the government officials or to their offices. * Death certificate will be provided after full verification. * One must apply before 21 days of the death of that person. Or else you need to pay a fine amount and you will have to take permission from the Registrar or Area Magistrate. * You must submit all the related documents as stated above while applying. * First you need to register the death before 21 days. Then only you can apply for the certificate. * Go to this official link. * Now click on services and Meeseva Services. * Now go to the death certificate and download it. Or directly download from here. * Fill all the details carefully like date of death, the name of the person, etc. * Now submit it to the registrar office and you are done. * Also, you can choose the delivery mode by yourself. Like if you will go to collect from meeseva then only Rs 15 you will have to pay. Within GHMC limit Rs 25, outside the limit Rs 40, and anywhere in India Rs 60, you will have to pay. * If you choose option 1 then within 4-5 working days you need to go for collecting your certificate. Or else it will come by courier. * Now go to the non-availability death certificate and download it. Or directly download from here. * Fill all the details carefully like date of death, the name of the person, etc. in a proper way as an application. * Submit it to the registrar office and you are done. * Verification will be done and you will get the certificate. * Click on the official site. * Now click on services and then go to Meeseva Services. * Now go to the death correction application form. * Download the pdf and take the print out. Or you can download it from here directly. * Fill the details carefully. Also, at the end of this form, there will be a list of documents. Just check that and choose any one which is easily available with you. * Submit the form along with any one document listed in that form to the registrar office. * Verification will be done and then the correction will be made. As these things are important nowadays. If you didn't make the death certificate and continue using the government services using that name, then, later on, you can put yourself in a great problem. So before that only you should clear all these things and go for the death certificate. As this is not a hectic procedure, so you can easily apply.